1000 Medium Grit - This stone is a very popular grit choice because it really starts to refine the edge. This stone is an excellent follow up after using the 220 stone. If your edge isn't very worn, you don't need to start any coarser than this. 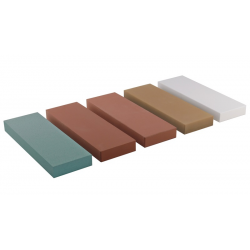 At price and grit, this is one of the best values in sharpening stones. 6000 Very Fine Grit - This is yet another good choice as a final grit for many tools and knives. This stone works very well after you've used the 1000 or 1500 grit, and is fine enough to be considered a polished edge. 8000 Extremely Fine Grit - This snow white stone is extremely fine. This is a wonderful final stage for most knives or tool edges. It differs in feel and cost from the rest of the line of Naniwa Traditional Water Stones. The pure white color also gives you the most visual feedback when sharpening. It technically does absorb water, but does not absorb water like the other stones in the line, this stone polishes well and is worthy of the difference in price. This stone replaces Naniwa's previous stone often called the Snow White.